I planned on roasting this chicken on Wednesday, but our oven wasn’t heating up properly. What’s a gal to do without an oven? I considered all sorts of alternative uses for the chicken, but I really had my mind set on this dish, so I figured I would wait it out. We indulged in some Vietnamese phở instead, which was, of course, delicious (and reminded me that I really need to make a trip to the Asian market to try my hand at an at-home version). The chicken was worth the wait, once it was finally on the table. I skipped a brine (gasp!) because we didn’t have enough kosher salt on hand and instead simply seasoned the chicken with olive oil, kosher salt, and freshly cracked black pepper. The flavors of the rice salad were also simple, but with a lovely variation in texture from the almonds. The rice absorbed the chicken-y goodness from being stuffed in the cavity during cooking and was absolutely delicious. Heat a large sauté pan over medium-high heat. Add olive oil and Brummel & Brown heat until Brummel & Brown is melted. Add shallot, celery, and almonds. Sauté until onion is translucent and onion and celery are tender. Add garlic and sauté 1-2 minutes until fragrant. Deglaze pan with beer. Add rice and parsley. Simmer until liquid evaporates. Stuff into chicken directly prior to cooking. Rub chicken with olive oil and season liberally with kosher salt and freshly cracked black pepper inside and out. Stuff cavity with curly leaf parsley and bay leaves. Let sit overnight on a roasting rack to allow moisture to evaporate. Remove bay leaves and parsley from cavity and stuff with brown rice stuffing (see above). Remove chicken from refrigerator and bring to room temperature. Roast at 475° for 15 minutes or until skin is light golden brown. After 15 minutes, reduce heat to 350°. 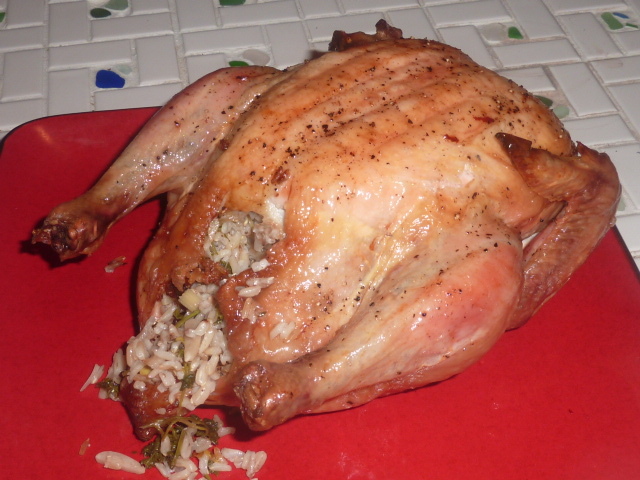 Roast chicken roughly 20 minutes per pound (rounding up to nearest pound), or until meat thermometer inserted into the thickest part of the chicken’s thigh reads 165º. If chicken becomes overly brown, tent with a piece of tinfoil.